Redcord Active Suspension exercises use body weight in slings to improve strength, muscular endurance, balance, coordination, and core muscle stability. It is an excellent workout for anybody regardless of age, ambition, or skill. The difference between Redcord and TRX is that Redcord allows us to work with every restriction of a client. This is also very comparable to the Pilates work. Redcord allows us to off-weight (through multi-point suspension) so that we can become more isolated on the muscles that we are trying to work with. Redcord facilitates proper body alignment and efficient movement patterns through use of slings and bungee cords that off-weight the user and make each exercise painless, safe and possible for everyone. Pilates work is really the foundation that makes a difference with Redcord. Redcord allows us to enhance what we feel and how we recruit the proper muscles that should be recruited for each exercise. 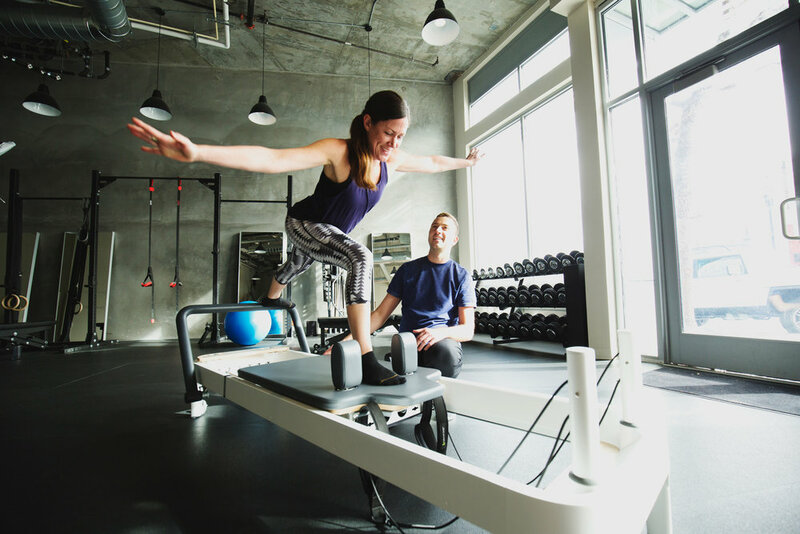 rebalanced SF combines Pilates with Redcord Active suspension training and is supportive for individuals with special needs yet can also challenge the most elite athlete. Core strength is the foundation of each exercise. As you develop core strength, you develop stability throughout your entire torso. Most exercises let us cheat. It’s easy to churn out reps without engaging our core or using a stronger side to compensate for a weaker one. Over time, the neglected muscles weaken and cannot respond when the brain signals them to move. Photography courtesy of Laurie Chapman. In 2000 Justin was pursuing a successful career in advertising in San Francisco. Committed to his work, Justin would spend prolonged periods of time sitting at his desk. The 10-hour days with poor posture began to take their toll and Justin noticed he was experiencing lower back pain. Before long the pain had developed from a nagging ache to becoming excruciating and preventing him from carrying out normal daily activities. In Justin’s quest for answers and healing, he discovered Pilates and on a trip to Europe, the Redcord system. This was a perfect compliment to his workout routine that helped him heal from his repetitive stress injury due to prolonged sitting and get strong and healthy again. In 2011 Justin was so inspired that he made the difficult decision to leave his successful career in advertising and to form rebalanced SF. As a certified Pilates instructor as well as the first and only Northern California certified Redcord Active Specialist, Justin offers unrivaled knowledge and experience in Redcord and Pilates personal and small group training in San Francisco. Justin is one of only 20 trainers in the U.S. to carry the distinction of Redcord Active Pro Specialist.